This bay front home in Bradenton Florida sits on nearly one acre of land and offers 4 bedrooms, 3.5 baths and sweeping views of the azure waters of southwest Florida. The original builders of this home made sure that all main living areas took advantage of the incredible water views. There is a large lanai with pool and spa which has southern exposure! The 16k boat lift has new motors installed and is in tip-top shape. There is additional docking space along the 105 feet of seawall. 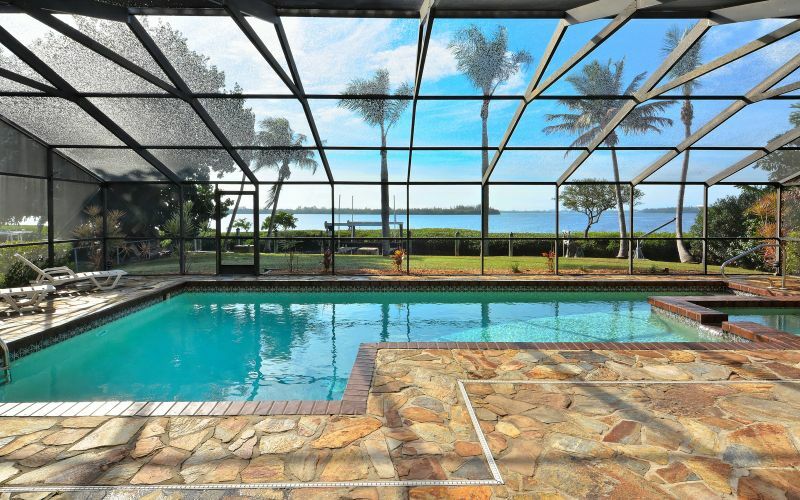 A bay front home in Bradenton Florida at this price, on this size lot is hard to come by. The home would be perfect for a family or as a fisherman's retreat. There are no bridges to contend with to access the bay as it sits directly in your back yard. Access to your favorite fishing spots in the Gulf of Mexico are a breeze as Longboat Pass is less than a 10 minute boat ride from your dock. Bradenton Beach is only a 2 mile drive! Wow, it doesn't get much better than that! Come see this bay front home in Bradenton Florida today.